Exploring the Fujairah Masterplan 2040: a milestone in the history of sustainability in the Middle East. In March 2012 Fujairah Municipality signed the agreement with Ramboll and the Middle East Investment and Management Consultancy for the creation of the Master Plan, a pioneering effort towards developing an emirate that thrives in the national economy in full respect of theenvironment. For this ambitious project, worth 12 million Dirhams, Fujairah Municipality is using MIMC’s knowledge and expertise in sustainable urban development to boost economic growth while ensuring that the infrastructures developed are environment friendly. · Tourism: the master plan will highlight the main attraction in the emirates as well as the construction of parks, gardens, resorts and tourist spots. · Transportation: the road and transport system will be enhanced to ensure ease of mobility, reduce traffic from private vehicles to reduce gas emissions. Additionally the current capacity of road network will be improved along with incident and emergency traffic management. · Environment: the master plan will assess residential as well as agricultural areas. New solutions for the protection of the environment will be implemented. MIMC and Ramboll are advising the client to provide top notch modern construction along with ensuring that all establishments and contractors will comply with the regulations and measures to reduce pollution. MIMC advices municipalities and commits to better the lives of our communities while promoting sustainability. As we assist the Municipality to turn the master plan of Fujairah into a successful story we look forward to more opportunities to resolve our clients’ environmental challenges. Ms. Razieh Ebrahimi joins Mr. Bill Clinton in the debate on International Education Industry at the Global Education and Skills Forum 2014. The Global Education and Skills Forum in Dubai is the key event for an understanding of the education industry, equity and employment. The leaders in the sector take part in this event where Ms Ebrahimi Razieh met with Mr. Bill Clinton at the event and has an interesting exchange of ideas later at the dinner following the event. 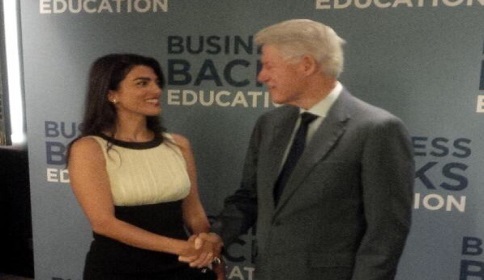 Ms Ebrahimi shared her thoughts and opinions with Mr. Clinton on the future of the education industry in Middle East. Focus of the discussion with Mr Clinton was electronic education systems and its importance. The Global Education and Skills Forum in Dubai brought 1,000 delegates from over 50 counties to UAE. The Middle East Investment and Management Consultancy and the project for The New Heart of Jeddah.. The Middle East Investment and Management Consultancy (MIMC) and its managing director, RaziehEbrahimi, are pleased to announce their involvement in the brand new plan for the urban development of the city of Jeddah (KSA) which will include three new residential, recreational and industrial cities. Because our company is committed to sustainability and sustainable urban development, MIMC is proud to announce its participation in this megaproject entirely focusing on sustainable urban growth. The extremely ambitious project launched in 2012 will be implemented in the 850,000 m2 master planned community district in the old airport area of Jeddah. One of the main objectives of this project is to return the old airport areaback to its original beauty. Additionally, the project aims at creating a city center for Jeddah which will constitute a major recreational area for residents and visitors. The new areas will showcase a completely new design reflecting the new vision for a sustainable and modern city. One of the most important aspects of a sustainable urban plan is that plan’s relationship and prescription for managing water resources. MIMC recognizes this fact and in The Heart of Jeddah leveraged modern technologies for treating wastewater and the reuse of treated sewage effluent (TSE). The STP MIMC designed for The Heart of Jeddah takes advantage of an extremely efficient and modern Membrane BioReactor (MBR) technology. An MBR combines both anaerobic biological process and a solids separation process in one tank. In other words, it replaces the traditional sedimentation tanks in a conventional activated sludge process with an ultrafiltration membrane thus resulting in a more efficient and less energy consuming overall process. Through the application of modern technologies MIMC designed the best possible STP given the site requirements. In addition to treating and cleaning wastewater, the project produced an additionally resource in the form of the TSE. MIMC designed a management plan for the city’s lake and canals in order to utilize the TSE produced by the STP. During the design review of water bodies objects in The in Heart of Jeddah MIMC assisted on assessing their layout, dimensions, depths and water volumes. We carefully addressed every possible variable such as evaporation,precipitation and water infiltration and inflows. With sustainability in mind we created a lake management plan that fully utilizes treated sewage effluent which fully complies with water quality requirements. The currentstatus of the project is advanced and the feasibility studies have almost being completed. The municipality is now securing finances and to bring the project infrastructure to life. Mohammed Al-Bugmi, the spokesperson of the municipality, has declared that the main building design is nearly complete and the documents for the tender of the infrastructure work have been finalized. Our company is providing innovative solutions for energy saving initiatives and projects. 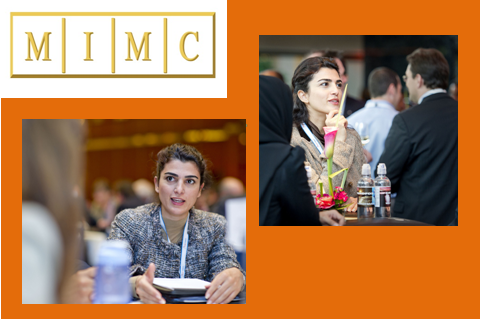 MIMC brings cutting edge solution to its clients through technical expertise and outstanding relationship management. MIMC welcomesall future environmental challenges and is eager to turn it into an opportunity to better the environment in which society lives. Middle East Investment And Management Consultancy bringing best environmental solutions, leading manufacturers and clients together. The Middle East Investment and Management Consultancy turned another challenge into a successful story while providing a perfectly self contained and stand alone solution at an optimal price to address the Fujairah municipality’s environmental issue concerning the increase of domestic waste in the emirate. The challenge at hand involved the absence of infrastructure and sustainable equipment locally. By leveraging on international partnerships, MIMC has utilized Kiverco’s cutting edge equipment and Diperk Power Solutions’ excellent power generators to deliver a Material Recovery Facility that is able to process 25 tonnes per hour of material and can provide clear and meticulous separation between organic content and non-organic material such as plastic cardboard and metal. Our facility has been supplied with top notch kiverco KL 840 trommel, which splits the material into 3 different sizes, with the larger waste streams then being manually picked to recover recyclables. MIMC has once again proved to excel in delivering the best technical solution and ensuring that the project schedule is running on time despite the adverse climatic conditions. Our new Material Recovery Plants are not only efficiently disposing of long standing waste disposal but they are boosting employment in UAE and generating high quality recycled material that can be resold to generate income. Another successful project for MIMC and its partners in the commissioning of Al Hayl STP. MIMC has overcome yet one more challenge with the design and construction of Al Hayl STP.MIMC advised the client to implement modern efficient technology to overcome the challenge being faced. MIMC introduced the municipality to the best services and equipment available in the global market. With the technology and machinery provided by our partners our team was able to resolve a challenging and ongoing environmental and safety issue. The waste water previously being discharged into the Al Hayl sewage lagoon in Fujairah was becoming not only an environmental but a public health concern. Hitachi’s membrane bioreactor technology, along with Amcon’s innovative volute equipment for sludge dewatering, were introduced to the municipality to achieve a highly purified treated sewage effluent(TSE). At the initial commissioning of the STP an issue arose of unstable concentrations of solid material collecting in the bottom of the sludge holding tank. The solution was to bypass air from one of the blowers to the sludge storage tank via hose to keep the concentration steady. Notwithstanding the constant changes in concentration we were able to achieve outstanding performance of the sludge dewatering system with water content of 83.04% and throughput of 34.42 kg-ds/hr. MIMC takes pride in facing our clients’ environmental challenges with a dedication to sustainability. Al Hayl STP can now potentially produce up to approximately1000 m3/day of high quality TSE to be reused in the neighboring communities. MIMC takes pride in its promotion of innovative ways to turn wastewater into a resource. Fujairah Municipality organize the workshop granting approval of the outcomes of the Major Strategic Plan for the Emirate of Fujairah . Fujairah Municipality, Rambol and The Middle East Investment And Management Consultancy (MIMC) reach a stepping stone in the Major Strategic Master Plan Development by organizing a workshop being held at the Novotel Hotel on Thursday November 13th. The scope of the workshop was to grant approval of the draft of the Master Plan of Fujairah. Illustrious personalities were attending the workshop with MIMC, amongst them H. E. Eng. Mohamed Saif Al Afkham, Director General of Fujairah Municipality, Mr. Abdullah Al Hantoobi, Debuty Director of Fujairah Municipality, Ms. Aseela Al Mualla, Director of Public Services and Environment Department, Eng. Nawal Yousif Al Hanaei, Director of Engineering and Lands Departments, Head of Buildings Section, Eng. Abdullah Al Khadim, Director of Project Management Department. His Excellency Al Afkham expressed words of gratitude for the chairmanships of Sheikh Khalifa bin Zayed Al Nahyan, President of the UAE and the guidance of His Highness Sheikh Hamad Bin Mohammed Al Sharqi, Member of Supreme Council & Ruler of Fujairah. Additionally H. E. Al Afkham has once again clarified the main scope of the Master Plan which is to keep pace with the increasing urban growth, boost economy and investment toward construction development, instruction and encouraging new construction projects for the community. The emirate of Fujairah, under the consultancy of MIMC, is determined to keep up with the extraordinary growth pace being experienced in UAE. The plan will not only focus on economic growth but on society, as a matter of fact provision of new and improved services to citizens sits at the top of the master plan priority list. By identifying the main resources available in the territory MIMC and Ramboll have catered a strategic master plan development which will lead to the creation of new tourist sited and parks networks for social and environmental benefits. Striving to provide solutions for environmental challenges deriving from population growth the municipality has shown an outstanding dedication to raise awareness of the need to preserve the environment for an enhanced quality of life and sustainability. Ms. Razieh Ebrahimi joins the panelists’ debate on water in the World Water Summit in Berlin. The global water summit 2011 was organized by global water intelligence in Berlin on April 18th and 19th. The conference gives an extremely interesting overview of the water consumption and supply across the globe identifying geographical areas where this resource is dangerously limited. Ms. Razieh Ebrahimi joins other CEOs and leaders in the debate on the possible development of water supply in the next 20 years. Two presentations drew the interest of the attendants at the summit: Tony Wray and Aladj Dieng’s presentations revealed an impending need to preserve water as a resource as demographic growth will have to face a decrease in water availability. Tony Wray, CEO of Seven Trent, gave a keynote speech on the water supply and demand in England and provided an overview of the development of the water consumption/provision in the nearest future. His data reveal 134 water treatment works were being carried out in UK in 2011, sewage treatment works totaled 1,021. Additionally the country supplied 1.8bn litres of drinking water each day and 2.7bn litres of waste water were being treated per day. The study warns on future scarcity of this important resource as there is less water available and it is more costly in south east of England. This situation stresses the need for an effective demand management strategy. Mr Wray also foresees an increased regulation and competition through a water trading framework; companies will have to drive innovation and technical solutions to preserve water availability. Aladji Dieng, technical director of Senegalaise des Eaux gave an introduction of the challenges and solutions implemented in Sub-Saharan Africa. He provided an overview of possible development opportunities to operators and investors. With a skyrocketing GDP growth in Sub-Saharan Africa which is increasing alongside a substantial population growth (4.3 % against 2.9% between 1990 and 2008). Mr Dieng drew a dramatic picture of a country where 330 million people in dub-Saharan Africa do not have access to improved sources of drinking water. In the list of main concerns is a staggering demand growth, increasing scarcity and climate changes. The government is trying to cope with the issue by improving the quality of the services in the water industry and restoring financial viability of the water sector which in return will encourage banks to increase their trust towards the sector and engage in lending. Another effort towards improving the water industry is to restore the water infrastructures and at the same time avoiding increases in the average price of water exceeding 3% increase a year. The image drawn during this extremely important Water Summit sheds light on the responsibility that each one of us has to prevent water from being wasted. Encouraging recycle of waste water is an incredible asset and solution to preserve this natural resource. By sharing her knowledge with a team of expert engineers and passionate professionals, Ms. Razieh Ebrahimi is promoting best practices and solutions to recycle waste water and turn waste into a resource. The Middle East Investment and Management Consultancy has committed to raising awareness in order to save natural resources for the betterment of our society and the environment we live in. MIMC assisting the Municipality of Fujairah to achieve a sustainable development. MIMC took part in the Fujairah Greenhouse Gases Inventory Workshop being held in April 7th 2013. The workshop has been organized under the patronage of H.H. Sheikh Mohammed Bin Hamad Al Sharqi, Fujairah Crown Prince, Fujairah Municipality in association with the Ministry of Environment and Water and Dubai Carbon Center of Excellence. The main topic in the workshop’s agenda was the development of guidelines to measure Fujairah’s green gases production and carbon footprint in an effort to build a more sustainable emirate. MIMC, as a key advisor and consultant for the development of the emirate of Fujairah, was taking part in the one day workshop during which our Managing Director Razieh Ebrahimi underlined the great opportunity that the guidelines will constitute to complement the Fujairah 2040 Master Plan. MIMC is committed to delivering a master plan that perfectly aligns with the “Fujairah Greenhouse Gases Inventory Workshop”. MIMC has catered a master plan based on the clients’ expectations to ensure vital issues such as climate change are addressed, best practices for a sustainable development are located while the efficiency and productivity of economic operations is increased and costs are decreased. Under Fujairah Municipality’s leadership and MIMC’s consultancy advice awareness has been boosted on the importance of sustainability. It was a great achievement and step towards a more sustainable country when the UAE Ministry of Environment signed a UAE-wide Greenhouse Gas emission baseline and other awareness and capability building initiatives have been undertaken earlier in 2013. MIMC continuously works to achieve an increased awareness of the importance of preserving the environment and its limited resources. Razieh Ebrahimi, Managing Director at The Middle East Investment And Management Consultancy (MIMC) and Ivano Iannelli, CEO at Dubai Carbon Centre of Excellence (DCCE) sign a long term cooperation agreement on April 28, 2013..
MIMC, having led the engineering and consultancy industry in the MENA region since 2006, has seen its commitment and dedication to sustainability being paid off after being once again selected as the partner of choice to work with Dubai Carbon Centre of Excellence (DCCE) PJSC. MIMC, under Ms Ebrahimi Razieh’s leadership, will cooperate with Dubai Carbon Centre of Excellence to assist with improving energy efficiency and reduce emissions. Reflecting UAE’s commitment to emissions reduction and with the Kyoto Protocol and United Nations framework convention on climate change in mind, the government will introduce new regulation to reduce the country’s carbon footprint. In line with the new regulations, Dubai Carbon center of Excellence has been founded in 2011 by three mainly Dubai Government-owned / majority-owned entities: the Dubai Electricity & Water Authority (DEWA), Dubai Aluminium Company (DUBAI) and the Emirates National Oil Company (ENOC), as well as a private environmental consultancy company, ISTIDAMA. The reason for its launch in 2011 was to facilitate Dubai’s transition to a low-carbon economy and to implement the Dubai Integrated Energy Strategy 2030 and Green Economy for Sustainable Development. Ivano Iannelli, Dubai Carbon Centre of Excellence’s CEO, has undertaken an entire list of projects that aim at reducing gas emissions. These projects have been planned as part of the initiative within the clean development mechanism (CDM), DCCE will work with MIMC to advise our company’s clients on projects falling in the scope of this pioneering plan for an increased sustainability; projects such as construction of green buildings and grid-connected solar installations, low-carbon business development and projects focusing on emissions reduction constitute the main pipeline. MIMC will be responsible for the development and management for DCCE and to coordinate the pre-tender, during and post-tender activities. Additionally MIMC will supervise the project team relationship management for DCCE. The Middle East Investment and Management Consultancy is excited to embark in yet another great journey facing new environmental challenges and turning them into a successful story for its clients. Driving change it’s not easy but by capitalizing on Ms Razieh Ebrahimi’s knowledge of the industry and long established international partnerships with leading environmental solutions providers, Dubai Carbon and MIMC will lead the way to a more sustainable economy in an emirate that strives to reduce its carbon footprints.